Tonight's Episode: Death in the Afternoon. After nearly a month and a half of growing, after two recall notices, after many measures intended to provide public safety, the Tomato Tree Stand had it's first death. Chipmunk? Poodle? Hummingbird? Senior Citizen? No. The first casualty of the Tomato Tree was, a tomato. Yes, Christine - The Stand of Death, has resorted to cannibalism. 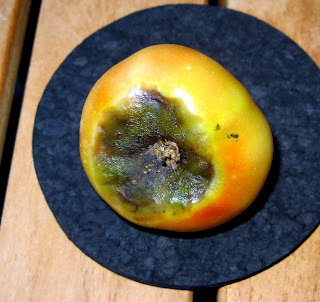 Yesterday afternoon I found a ripening tomato destroyed by some sort of fungus. What's interesting about this problem is that among the vaunted advantages of the Topsy-Turvy Tomato Planter, is the elimination, that's right, elimination, of ground fungus, harmful bacteria and cutworm damage. As the pictures show, Crabby is having some sort of fungus/bug problem. Can anyone out there in Crab Nation identify what is happening to my tomatoes? Anyone, please? To my thinking, the whole point of the Topsy-Turvy was to have tomatoes sooner (per the infomercial), with fewer diseases/pests (per the infomercial), and less overall stress, (read the recall notices). So far, nada. 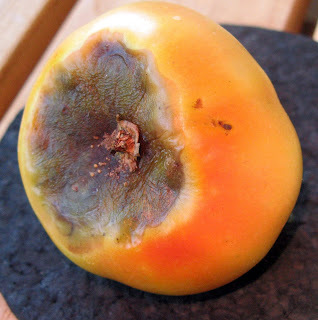 Yes I do have some tomatoes starting to ripen, but they are ravaged by some disease. The other plants in the planter show almost no fruit. August is beginning to look like a grim harvest. Next time back to recipes. May God have mercy on my tomatoes. Crabby Quiz: Pretty easy one this time. There are two literary references in this post, at/near the beginning. Please identify. I've had this problem before, but was able to save most of my tomatoes before the end of the growing season. Good luck! Thanks Maremare, I'll get right on it. Will send a pic of my disaster within the next week. Thank you Ceres, (though I'm troubled that I had to go to and OSU site). Calcium it is. I just poured a gallon of milk into the container, all should be fine now.